URL Redirect allows you to redirect client requests to defined targets, which may or may not be what the client requested. This feature is a very popular and should be used with some imagination and logic to get the best results. A regular expression matching the URL you wish to redirect. The URL will always be in the form "protocol://host/file" or "/file" for HTTP requests. This may be trailed with a / followed by flag characters like in Perl to modify options used to compile the regular expression, and must be, if a / is used anywhere else in the regular expression. The port to redirect to. If left blank, the same port to which the original request was made, is used. If yes, a 302 redirect is used; otherwise the new host is connected to directly and the new file is requested. A 302 redirect should always be used when possible to ensure relative links and images are correct. Encode URL - Encode the new URL. 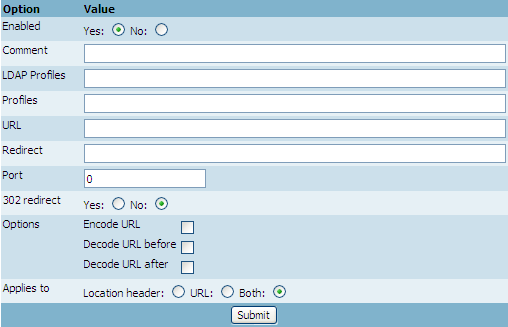 Decode URL before - Decode the URL before attempting to match it with the regular expression. Decode URL after - Decode the new URL after matching. Select whether the redirection applies to requested URL's, the Location header when a remote site sends a 302 redirect, or both. SafeSquid automatically produces the auto-configure-script proxy.pac (Proxy Auto Configuration) file, that clients can use to automatically configure the proxy server. This file can also be used by WPAD (Web Proxy Automatic Discovery) protocol, which allows automatic discovery of Proxy servers. The following redirect rule will redirect any client request for proxy.pac file to the default SafeSquid proxy.pac file. See Enforcing Google, Yahoo and Bing SafeSearch for another example.